I love Mexican food and could eat it everyday. Making meals out of guacamole, salsa, and chips is one of my favorite things. 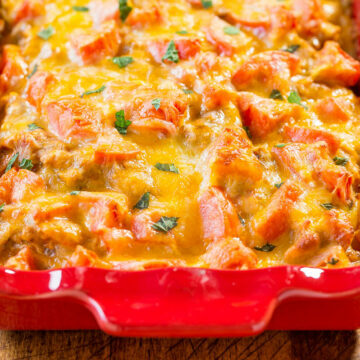 But my family needs a little more and that’s where this easy enchilada bake that’s ready in 30 minutes comes in. It’s not like traditional enchiladas where you have to carefully fill and roll up each tortilla individually. Instead you simply stir together shredded chicken (use storebought rotisserie or leftover chicken to save time) with sour cream, salsa, and taco seasoning. Then rather than filling and rolling tortillas, you cut up tortillas and layer them in a baking pan with the chicken mixture, tomatoes, and cheese. All the layers of goodness remind me of lasagna but with a Mexican flair. There’s so much flavor and just a touch of heat from the salsa and taco seasoning. I used medium heat but you can go as hot or mild as you like. 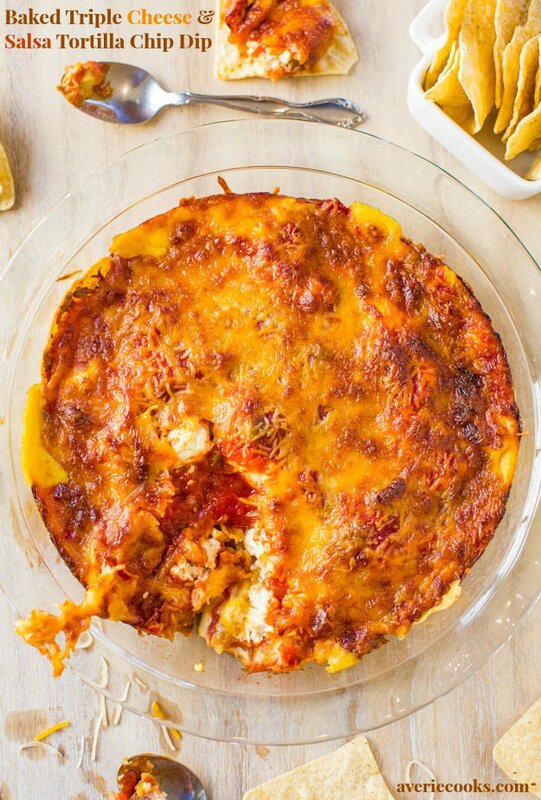 The juicy tomatoes and gooey melted cheese with the soft tortilla shells make this an instant comfort food family favorite that would also be great for game days or parties. You can prep this up to two days in advance and bake it off when you’re ready for an easy make-ahead meal. And you’ll likely have planned leftovers. A double win. 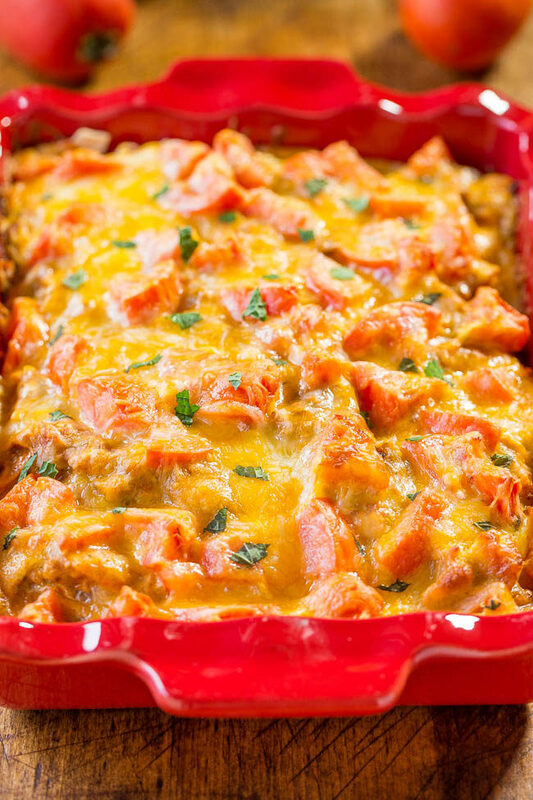 This fast and easy enchilada bake is ready in 30 minutes and isn’t like traditional enchiladas where you have to carefully fill and roll up each tortilla individually. Instead you stir together shredded chicken with sour cream, salsa, and taco seasoning. 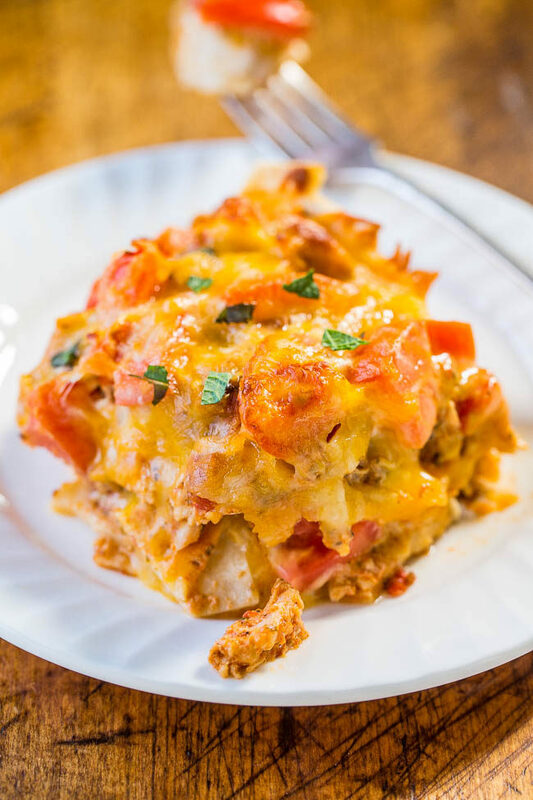 Rather than filling and rolling tortillas, you cut up tortillas and layer them in a baking pan with the chicken mixture, tomatoes, and cheese. There’s so much flavor and a touch of heat from the salsa and taco seasoning. 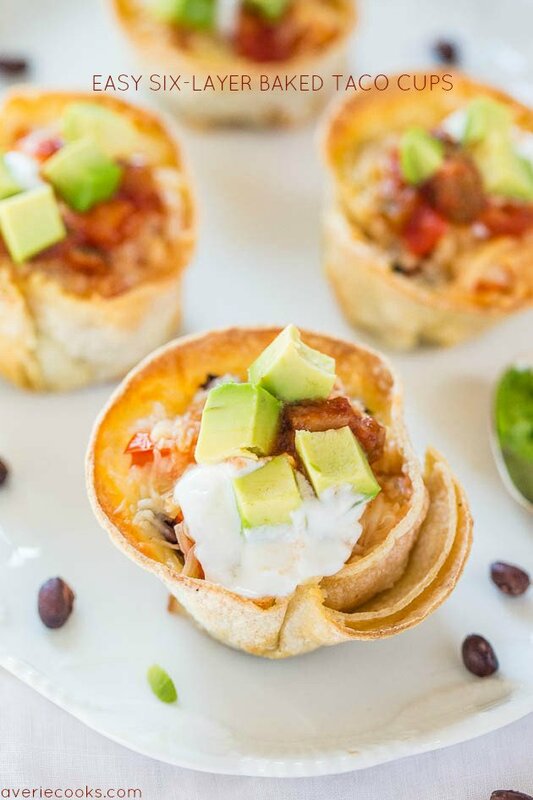 The juicy tomatoes and gooey melted cheese with the soft tortilla shells make this an instant family favorite. You can prep this up to two days in advance and bake it off when you’re ready for an easy make-ahead meal and you’ll likely have planned leftovers. Preheat oven to 400F degrees. To a large bowl, add the chicken, Greek yogurt or sour cream, taco seasoning, 1 1/2 cups salsa, and stir to combine; set aside. 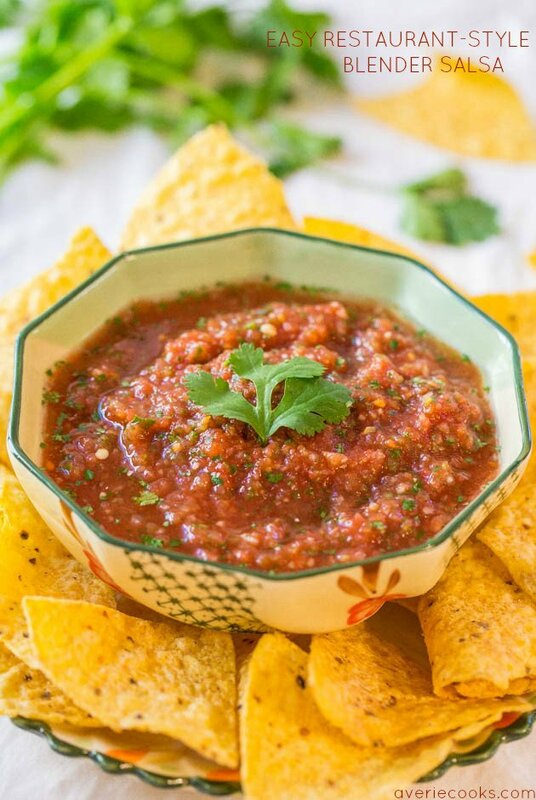 To an 9×9-inch baking pan or similar (I used an 8×11-inch baking dish), add the remaining 1/2 cup salsa and spread evenly. Place half the tortillas on top of the salsa in baking pan. Top with half of the chicken mixture, half of the tomatoes, half of the cheese, and any optional ingredients. Repeat layering process using remaining ingredients (tortillas, chicken mixture, tomatoes, cheese, optional ingredients). Tip – At this point you can wrap in foil and refrigerate for up to 2 days before baking. Bake for about 20 minutes or until cheese is bubbly and lightly golden. 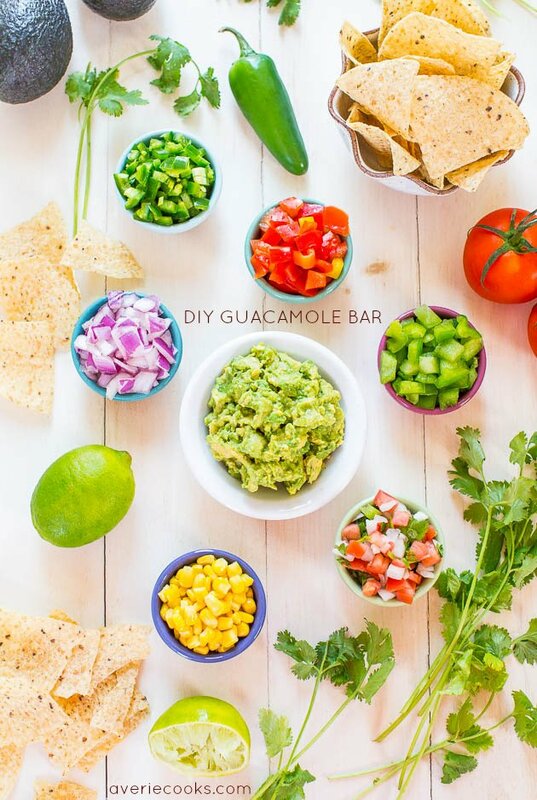 Optionally top with sour cream, guacamole, or salsa prior to serving. Dish will keep airtight in the fridge for up to 4 days or in the freezer for up to 3 months. 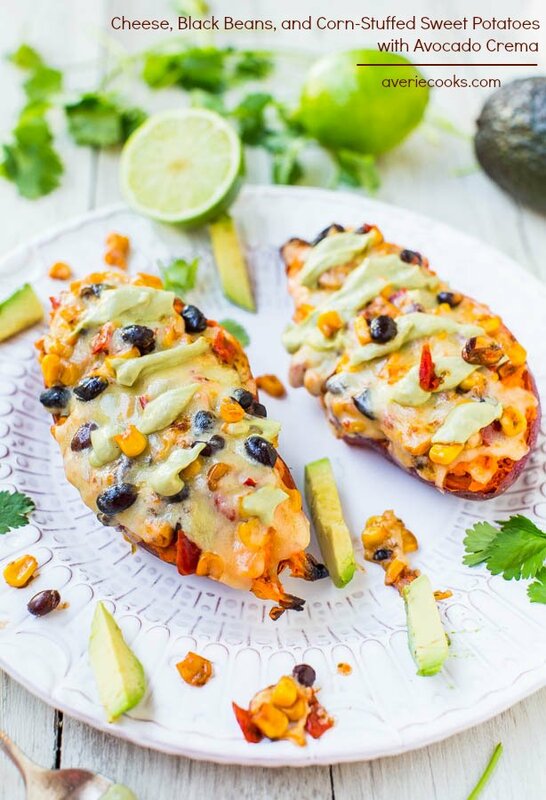 Cheese, Black Beans, and Corn-Stuffed Sweet Potatoes with Avocado Crema (vegan, GF) – A healthy meal that’s easy, ready in 15 minutes, satisfying, and doesn’t taste like health food! Baked Triple Cheese and Salsa Tortilla Chip Dip – Loaded with 3 kinds of cheese & baked to browned, bubbly, golden perfection! Always a hit at parties and great for game days! 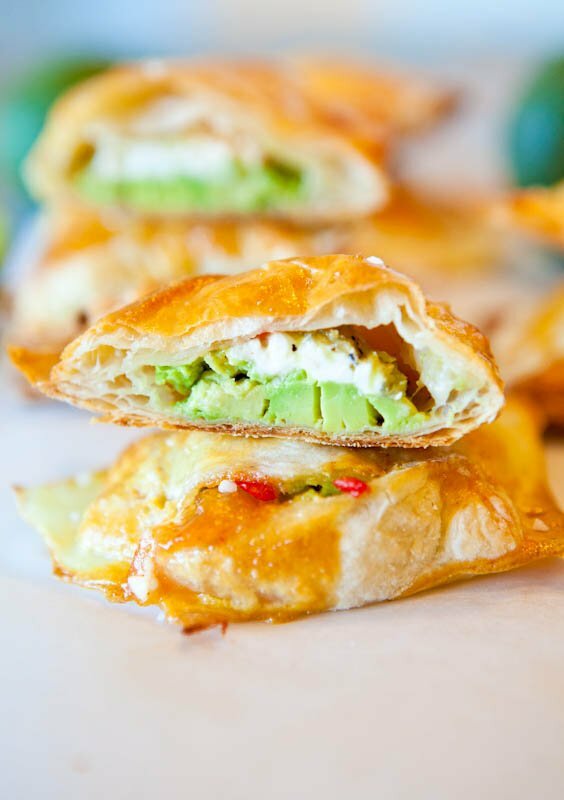 Avocado, Cream Cheese, and Salsa-Stuffed Puff Pastries – One of my most popular recipes in 2012 and 2013! 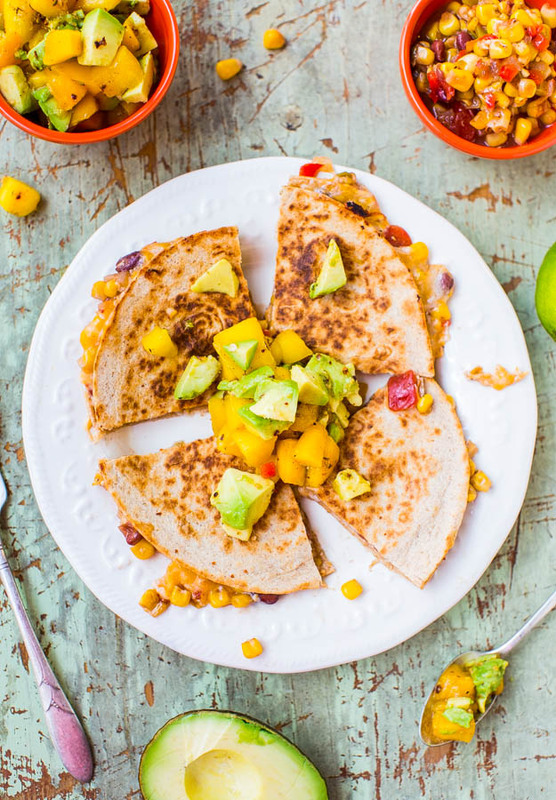 Lightened Up Corn and Bean Quesadillas with Avocado-Mango-Chipotle Salsa (vegetarian/vegan, GF) – Ready in minutes and under 300 calories! Looks delicious! For the tortillas, just tear them into pieces before layering? Can’t wait to try this! I’ve made enchiladas before and this looks so much easier ( with planned leftovers too)! I know Jon will love this so it’s going on my to do list for later in the week. You and I both like our planned leftovers :) LMK what Jon thinks if you try it! Can you believe that I had my first chicken enchiladas THIS YEAR? Mexican wasn’t a thing when I grew up in Canada, but now I want it ALL THE TIMES. I am loving this easy version, that I can totally whip up on a busy weeknight! Pinned! Well better late than never, right! Thanks for pinnig! I can eat Mexican food every day of the week, too. Love this recipe – it sounds super flavorful and quick – my favorite kind of meal. I like that you used Greek Yogurt as an option, too. Yum! Girl, THIS. I used to make enchilada casserole at least once a month. I used refried beans, peppers, chicken, and salsa. I truly can’t even imagine spending all that time to roll individual enchiladaas ever again. The sloppiness alone makes me cringe. The first time I did a casserole, I knew I’d never make them regular again. And I haven’t! 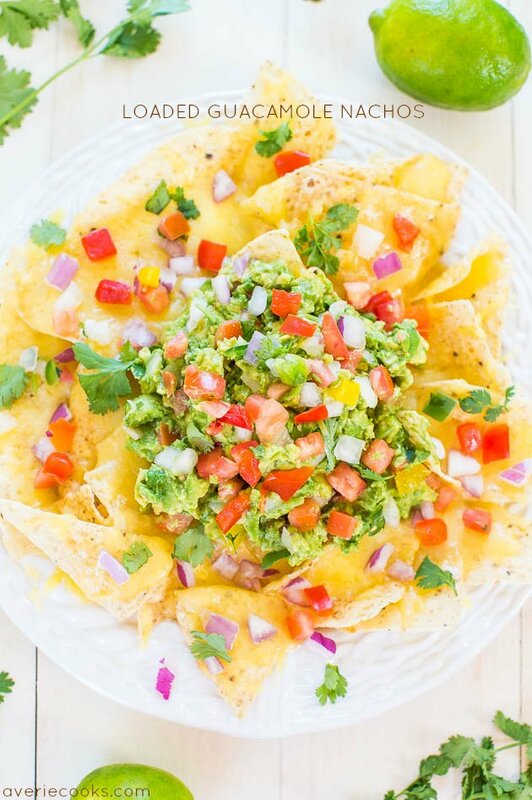 Top that with tons of guac and OH LORD. I love shortcut dishes with tons of flavor and a good amount of cheese! Pinning! It’s such an easy, family-friendly recipe, too! Thanks for pinning! I could also eat Mexican food every day! This looks great and I love that you don’t have to roll the enchiladas up. Yum! I’ve never made traditional enchiladas–can you believe it? This looks easy and tasty. Well don’t bother. Just made this :) WAY easier! This looks amazing! I’m definitely going to have to give this a try really soon! 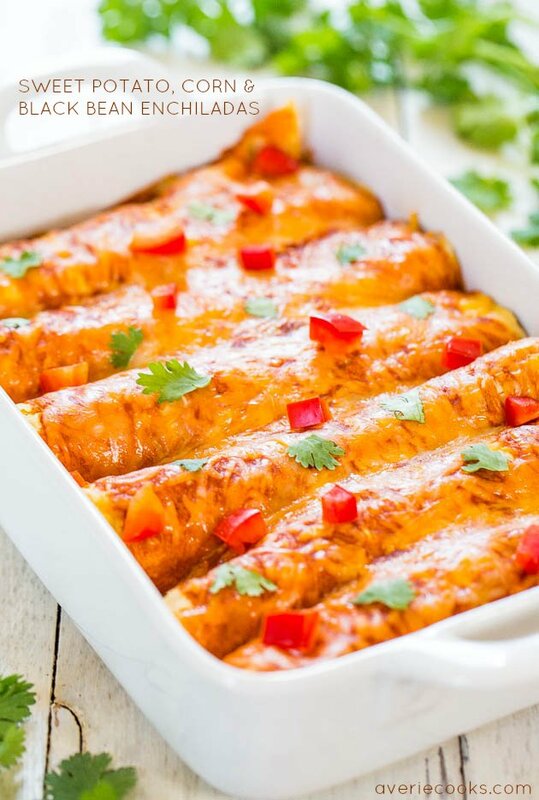 This looks so good, I think it sounds even better than traditional enchiladas! These look so good and I love that they are an easier prep…that red dish…love it. It seems like a fall/winter-colored dish to me :) Even though it’s 80+F in San Diego still! This is absolutely fantastic! Mexican is my comfort food, and enchilada casserole is always the best! Also: planned leftovers. Always the best! Makes for very easy lunch-packing duty for the next day or dinner the next night! I could also eat Mexican everyday!! Especially enchiladas :D Great shots! Again thank you so much and I can’t wait to try out more of your recipes! Wow, thank you SO MUCH for this amazing comment. This is why I blog. Seriously, women like you are why I blog! So glad that you have some kitchen confidence now and that you’re not only cooking from a recipe, but adding things! I looooove black beans (and mangos!) both so much and would have eaten the heck out of your rendition! It sounds wonderful! LMK if you try other recipes and how things go! Thanks for your support! Made this last night…. family loved it! – Next time will add a can of black beans – but was very happy how it turned out. Now to pin it to my board of Things I Have Made. Thanks for trying the recipe and I’m glad it came out great for you! Thanks for pinning!